Minimalist design. Explore all the patterns without distractions. Set wallpaper automatically with the patterns of your choice. Browse the latest and most popular patterns from the community. Search patterns by keyword or color hex code. Keep a list of your favorite patterns using the ★ button. Save any pattern wallpaper to your Android gallery. View the COLOURlovers community stats for each pattern. Touch devices back-to-back to transfer patterns. "Pattrn is the New King of Android Wallpaper Apps"
"Pattrn upholds the time-honored tradition of looking for cool wallpapers." "If you value nice design and like your wallpapers original and great-looking, definitely check this unique little app." "Pattrn is an excellent little utility to have on your Android device. It works great on both smartphones and Android tablets." 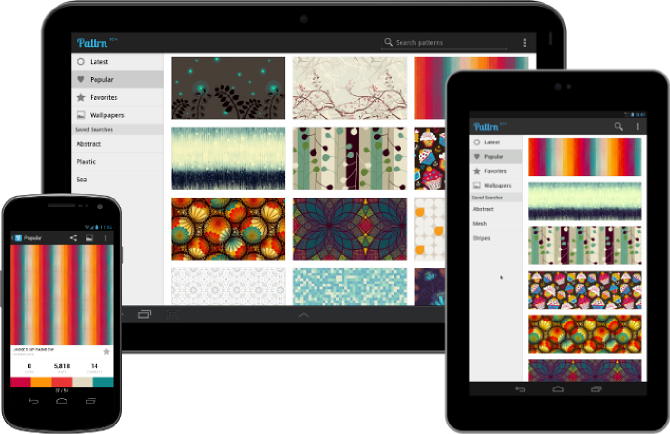 Get inspired everyday with a beautiful pattern on your Android. Pattrn is an unique wallpaper app for phones and tablets that gives you access to the huge collection of patterns created by the COLOURlovers community. Proudly crafted by Lucas Rocha. All rights reserved © 2012-2018 Lucas Rocha.